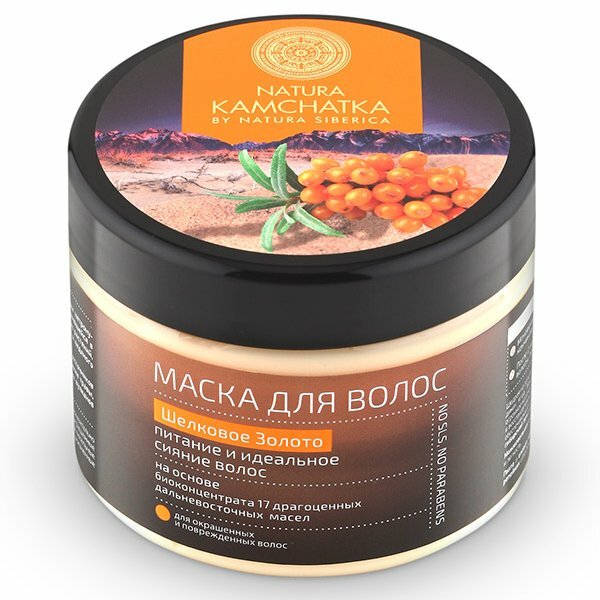 Silky Gold Hair Mask is produced by the Russian beauty brand Natura Siberica for its Natura Kamchatka line. It is specifically designed for dyed and damaged hair. The product is formulated with a blend of 17 oils obtained from Siberian plants harvested in the wild. The manufacturer promises a visible result after two weeks of regular use; the mask restores damaged hair structure, keeps the hair hydrated, and makes it soft and tame. Silky Gold Hair Mask is designed to provide your hair with nutrients and make it shiny. Its formula is rich in herbal extracts and natural oils that help to keep the hair healthy and beautiful. The mask nourishes the hair, makes it silky and soft, keeps hair colour from fading, and prevents dull and lifeless hair. Key ingredient in the mask is an oil concentrate that contains 17 vegetable and essential oils obtained from Siberian plants. Sea buckthorn oil, cloudberry oil and cranberry oil actively nourish the hair and repair its structure, as well as stimulate keratin synthesis to prevent further damage caused by harmful environmental factors. The concentrate also contains cedarwood oil and linseed oil that restore the natural brilliant shine of the hair, as well as Siberian fir oil and Norway spruce oil that improve hair elasticity. Burdock oil (burdock root macerate) strengthens hair roots and stimulates hair growth. Directions. Apply to wet hair, leave for 5–10 minutes, rinse thoroughly. Ingredients. Aqua, Cetearyl Alcohol, Ricinus Communis Seed Oil, Glyceryl Stearate, Cyclopentasiloxane, Rubus Chamaemorus Seed Oil, Prunus Armeniaca Kernel Oil, Pinus Sibirica Seed OilWH, Oxycoccus Palustris Seed Oil, Linum Usitatissimum Seed Oil*, Hippophae Rhamnoides Fruit Oil, Prunus Persica Kernel Oil, Triticum Vulgare Germ Oil*, Arctium Lappa Root Extract, Hydrogenated Soybean Oil, Oryza Sativa Bran Oil, Ribes Nigrum Seed Oil, Vaccinium Myrtillus Seed Oil, Picea Excelsa Oil, Cedrus Atlantica Bark Oil, Juniperus Communis Wood Oil, Mentha Piperita Oil*, Abies Sibirica Oil, Achillea Asiatica ExtractWH, Pinus Sibirica Seed Oil Polyglyceryl-6 EstersPS, Hippophae Rhamnoidesamidopropyl BetaineHR, Behentrimonium Chloride, Cetrimonium Chloride, Lauryl Glucoside, Parfum, Benzyl Alcohol, Benzoiс Acid, Sorbic Acid, CI 15985, CI 19140. Want to buy Silky Gold Hair Mask? Call us or submit your order via our web site!